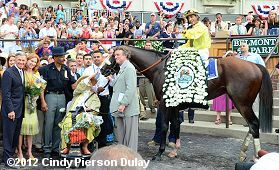 Jamie Wyeth, husband of owner and breeder Phyllis Wyeth leads Union Rags to the winner's circle after the 2012 Belmont Stakes. The $1 million Belmont Stakes (G1) is the final leg of American racing's Triple Crown and the highlight of the New York racing season, contested at the marathon distance of 1 1/2 miles, one complete trip around the main track at Belmont Park. With Kentucky Derby (G1) and Preakness (G1) winner I'll Have Another scratching out of the race due to injury, American racing will have to wait for the next Triple Crown winner. A field of 11 three-year-olds went to post in the 144th "Test of the Champion" before 85,811 fans on a mostly sunny Saturday with intermittent showers and temperatures near 80. As expected, Kentucky Derby winner Dullahan was sent off as the 5-2 favorite off his third place finish in the Kentucky Derby 5 weeks back. 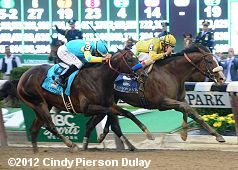 In to challenge him included 11-4 second choice Union Rags, seventh in the Derby last out, and 4-1 third choice Paynter, winner of an allowance after finishing second in the Derby Trial (G3). 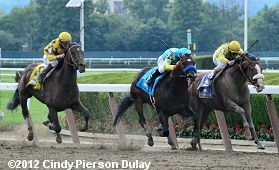 Union Rags on the rail takes the lead from Paynter with Atigun behind in third. Jockey Mike Smith sent Paynter to the lead first time past the stands and he set fractions of 23.72, 49.23, 1:14.72, and 1:38.85 while stalked by 12-1 Unstoppable U and Union Rags. Entering the stretch, Paynter held a short 1 length lead through 10f in 2:04.39, but jockey John Velazquez sent Union Rags through along the rail. The pair dueled briefly but in the final 1/16 mile, Union Rags pushed his neck in front to get the win in 2:30.42 over the fast main track. It was another 1 3/4 lengths back to 20-1 Atigun third. 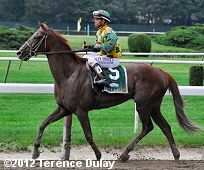 Favored Dullahan raced 9th early but failed to rally, checking in 7th beaten 11 lengths. 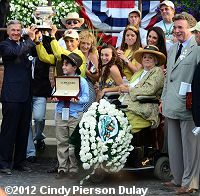 Left: Union Rags in the winner's circle with owner/breeder Phyllis Wyeth (in the wheelchair), her husband Jamie Wyeth (holding his head), and trainer Michael Matz (far left). Phyllis Wyeth said, "It was my dream and he made it come true. Nobody would have gotten through on the rail other than Johnny. That was unbelievable. He just said, 'Move over, I'm coming.' He believed in the horse, and Michael got him there." Right: The winning connections celebrate with the trophy. 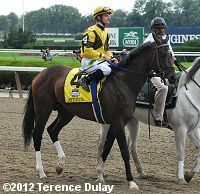 Trainer Michael Matz said, "I'm just glad for Phyllis and the horse, we just got to see the real Union Rags." 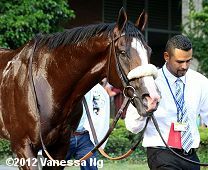 Left: Union Rags in the paddock before the race. Jockey John Velazquez said, "I just wanted to get in a good rhythm that he feel comfortable where he was.� He did everything really well behind the horses.� Coming down the stretch, tell you the truth, it was my intention to come in there, but when (Atigun) came over in the 1/4 pole and went out next to me.� I said well, 'This my opportunity to get on the rail. '� When he got close to Mike Smith, and I saw Mike put the whip left-handed, I said, well, this could be my chance.� I rather stay here and wait for the hole to open and it just happened I got lucky." 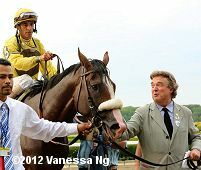 Right: Union Rags took a while to settle in the winner's circle. 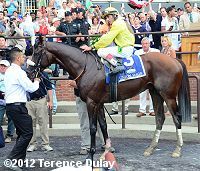 Trainer Michael Matz said, "We always thought this horse had Triple Crown potential. When we trained him, we gave him four races as a 2-year-old and gave him a rest and had a good plan. He never missed a beat. His first race couldn't have been any easier. He had trouble in his second race and his third race. I do really think that this horse, when he has a clean trip and can show himself, is one of the best 3-year-olds in this crop. Whether he could have done something against I'll Have Another, I don't know, but it sure would have been fun to see." Left: Union Rags heads to the barn after the race. Right: Second place finisher Paynter returns after the race. Trainer Bob Baffert said, "I need a Triple Crown for seconds. I really thought he was going to win today. He was doing so well. I just feel bad for Mr. Zayat. The poor guy, he's been tortured on this Triple Crown. Turning for home, I knew we had the horse to do it and that horse snuck up on him there. He's still a young horse, still learning how to run." Jockey Mike Smith added, "He ran tremendous. I'm such a perfectionist. 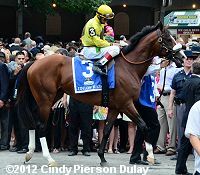 (Union Rags) just shouldn't have gotten through on me. I'd like to see what the outcome would have been if he wouldn't have. Left: Third place finisher Atigun in the post parade. Jockey Julien Leparoux said, "There was a clean race for everybody, so that's very important. For us, as the jockeys, for the people watching the race, it's great to see a clean race. I hope everybody had fun today. We had a good trip. We stayed inside most of the trip. I could get him out around the turn, I thought I had a good chance to win, he made a nice move. He ran a big race, so that was good." Right: Seventh place finisher and beaten favorite Dullahan returns after the race. Trainer Dale Romans said, "The race unfolded like it looked on paper to me. 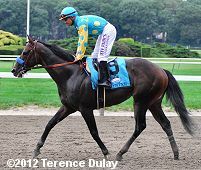 Paynter ran a big race, they all ran big, Union Rags ran big; we just didn't have a finishing kick. This is a good horse, a very good horse. I was sure he was going to run a really big one. It's disappointing. I'm not going to make excuses for him. I said all along I thought he could handle the dirt. I think it puts Union Rags in the picture for an Eclipse Award, I would think. There's a lot of year left, and with I'll Have Another out, it's definitely in his own hands." Left: The horses break from the gate for the Belmont Stakes. Right: The Belmont Stakes jockeys pose before the race. Front row from left to right: Ramon Dominguez, Corey Nakatani, Mike Smith, John Velazquez, Javier Castellano, Rosie Napravnik. 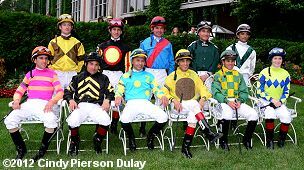 Back row: Julien Leparoux, Junior Alvarado, Kent Desormeaux, Alex Solis, Jose Lezcano.